immediate solution, not a last resort. Detailed proposals are made to improve courses for immigrants with native languages unrelated to conventional European school languages. At the same time, this paper calls for a bringing together of foreign languages teachers and teacher educators to conduct combined research on what works best for foreign language learners. claire: Pour les débutants le support par la langue maternelle est une solution immédiate, il n’est pas un dernier recours. Des propositions détaillées sont offertes pour améliorer des cours pour les immigrés qui ont une langue différente que les langues conventionnelles offertes dans les écoles européennes. En même temps, cet article fait un appel aux professeurs de langues vivantes et aux formateurs d’enseignants à travailler ensemble pour faires des recherches collaboratives pour trouver les meilleures méthodes d’apprendre une langue étrangère. In Europa und der westlichen Welt im Allgemeinen hat sich der monolinguale Ansatz im Gewand des kommunikativen Ansatzes – klar ein Ableger der direkten Methode – bis zum heutigen Tage duchgesetzt. Dieser Beitrag plädiert für eine gründliche Überarbeitung einer Methodologie, bei der die Muttersprache der Lerner nur als Nothelfer fungiert. Der Artikel zeigt unterschiedliche Lernergruppen, die jeweils die Effektivität des bilingualen Ansatzes bezeugen. Damit ist klar, für Anfänger ist die Unterstützung durch die Muttersprache eine unmittelbare Lösung und nicht einfach ein letzter Ausweg. Es werden Vorschläge gemacht, um Kurse für Zuwanderer mit nicht-europäischen Herkunftssprachen zu verbessern. Zugleich plädiert der Artikel für eine engere Zusammenarbeit von Lehrern und Lehrerausbildern. Es gilt, sich über effektive Unterweisungstechniken zu verständigen. Dieser Beitrag wurde unter English articles abgelegt am 8. November 2018 von WolfgangButzkamm. Pictures can clarify many words, but, as empirical studies have shown, they are not good at clarifying constructions to a point where they can be re-used and modified to fit new situations. Learners must comprehend how the different meaning components interact to produce the overall meaning. In other words, constructions must become transparent. Pictures can’t do this, but another language can. “Will you make me a sandwich?” Pictures can illustrate this scenario but not the precise wording that was actually used to produce the meaning. It could have been: “I could do with a sandwich now.” Or: “What about a sandwich?” Or: “Have you got a sandwich for me?” etc. A mere situational or global understanding as illustrated by a picture is not good enough to help learners understand a construction to the extent that they could induce the structure and adapt it to different situations, thus making – according to Humboldt – “infinite use of finite means”: “Will you make him /her / them a sandwich?” “Will you make us a drink?” Pictures never ever have the perspectival flex­ibility of a language to clarify the constructions of another language. If we can use the learner’s mother tongue, many problems disappear. It is the structural richness of one language that best explains the structural complexities of another. Looking backward: When audiovisual textbooks with dialogues accompanied by picture strips and audioversions on tape appeared on the market in the 1970s, it was claimed that, at long last, a purely monolingual approach could be fully implemented. With the help of the pictures, so the authors maintained, every teacher could easily convey the meanings of the dialogue lines. The direct method was said to have failed in the past only because of the artificial conditions of classrooms which excluded real life. But carefully devised pictures, also available as slides, could bring the real world into classrooms and do the job. Bilingual vocabulary lists were no longer necessary.- This reasoning should be confined to the dustbin of history. A naturally acquired language, usually the mother-tongue, is the sharpest tool to cut into the anatomy of another language. Dieser Beitrag wurde unter English articles abgelegt am 15. Mai 2018 von WolfgangButzkamm. Exploiting the combinatorial power of language. This lecture has two parts. In the first part I shall talk about how we humans learn languages independent of teaching arrangements. These observations provide the theoretical point of departure for my teaching suggestions. First, analysis of natural language acquisition, second: teaching proposals. Because we can only teach with confidence and clarity, if we understand how learners learn. In language use and language learning, meaning is all-important, and comprehension is the key to learning. We begin to pick up the language when we identify bits of language and their meanings. Obviously, comprehensible input, usually defined as understandable messages, is the necessary condition for language acquisition. But it is not sufficient. Learners will crack the speech code only if they receive input that is comprehended at two levels. They must understand both what is meant – they must understand the message – and how things are quite literally expressed, i.e. how the different meaning components are put together to produce the message. This is the principle of double comprehension. In many cases both types of understanding can be conflated into one process, in others not. Children often get the meaning first before they understand the wording in detail. They initially acquire utterance wholes, fixed formulas (also called routines) which must be carved up until all their constituents and content elements can be used freely. This learning process has been graphically demonstrated by Lilly Wong-Fillmore (1976), who observed five Mexican immigrant children in their Californian primary school, in their families and on the playground for a school year. Bit by bit the children began to break down their formulas and perceive a pattern with open slots in it allowing their language to become productive. The structures eventually became variable in all their slots. “Ich wieheißtdu Fathma“ is an example from German as a second language. So children make the passage from formulas or chunks like Lemme-see-it to Let Robert see it; Let him do this etc. ; they begin to understand their internal grammar by extracting the words which they then use to build utterances of their own. Here are examples of the pattern-finding process from L1 acquisition. English children make mistakes such as it’s went or it’s played. French: Tu peux me taider? The model for this phrase is probably parental utterances such as Attends, je vais t’aider. So for my grandchild Astor, who grows up in France, the verb is initially taider, not aider. He has not separated out verb and pronoun. German: Wenns du kommst. The force behind this are phrases like wenn’s geht, wenn’s regnet. But what about: Zerlaubst du’s? This is a real puzzle. How does it come about? Clara & William Stern, who noted this down, suggest that the phrase comes from an incomplete analysis of Papa hat’s erlaubt / Mama hat’s erlaubt. I hope you‘ll never forget it. Children have to solve numerous riddles on their way to grammar. So let us keep our sense of wonder alive. Language acquisition is not an easy thing, not just child’s play, it’s a miracle deeply embedded in our genes, but a miracle which we slowly begin to understand. Incidentally, at this point in first language acquisition, parents help their children in various ways. Here are two ways you are all familiar with. At the beginning, parents tend to avoid personal pronouns. „Now Mary has got the ball. Now Mummy has got the ball – instead of saying “you” and “I”. Mary and Mummy are unambiguous, whereas the pronouns change their referents and are more difficult to grasp. And parents ask a lot of didactical questions such as What’s Mummy’s name? What’s your little sister’s name? Caregivers give the child very finely tuned feedback, they restructure their own language, so that many parental utterances can be seen as mapping aids as well as segmentation aids that separate out, isolate and identify certain meaningful constituents and thus ease their children’s way into language. They make them hear certain words so that they stand out clearly – words which normally run together and blend together in a continuous stream: “Mamakommtgleich”. All learners, not just children in natural acquisition situations, have problems in sorting out individual words and their distinct meanings, as we can see in the following examples. A child learning English in kindergarten produced the sentence “I need three napples, please” ( as reported by Peltzer-Karpf, (2003)). He must have thought that “an apple” was actually “a napple”. The same kind of error was made centuries earlier when along with the Spanish fruit the Spanish word “naranja” was imported into England and wrongly understood as “an aranja”, which became “an orange”. Analysis stopped half-way. Similarly, classroom learners must break down utterances from their constituent parts in order to be able to recombine them meaningfully. French beginners are usually taught the phrase “Je m’appelle Christophe”. What Germans usually understand is “ich heiße Christophe”, which becomes a puzzle when they see it printed. So they should also know that the French actually say “Ich mich nenne Christophe”. Again, double comprehension is needed. But puzzling this out costs mental resources. So why not clarify it right away by mirroring the phrase in German, as I just did? Whereas the French say “le petit poisson bleu”,” der kleine Fisch blaue”. In my next example a pupil remembers a typical misunderstanding: “Our teacher often demanded silence with the expression: [pikwait]. To me this was one word and I was absolutely proud when some day I learned the word „quiet“ and discovered its meaning. 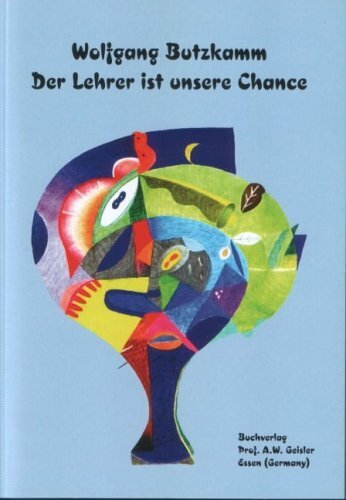 Although I had sensed what Herr X meant to say I could then correct the pronunciation in my mind because I had identified the isolated words.” Only from then on are sentences like be nice, be good, be friendly within her reach. Or take the phrase See you tomorrow. German beginners who don’t see the phrase printed automatically assume this means bis morgen, which is literally until tomorrow. With this half analysis they can produce time phrases such as see you later, or see you on Monday etc., but it will prevent them from producing location phrases like see you at the gym, see you at the bus stop. Only a full analysis of the phrase such as provided by mother tongue mirroring Seh euch morgen will do the job. Double comprehension is both necessary and sufficient. How old is it? – Wie alt ist es? How long is it – Wie lang ist es? How expensive is it? – Wie teuer ist es? etc. „Tes̜ekkür ederim“, in Turkish, means „thank you“. You’ve understood the message, which – as I’ve just said – is a necessary condition for acquisition, because you can now use the phrase yourself. But a formal, analytic understanding will take you much further: *”Thanks I make” or even better: “thanks make-I”. Because „I“, the personal pronoun, is expressed by the ending -im. This kind of explanation, which I‘ve called mother tongue mirroring, is an elegant, plausible and highly satisfying way of clarifying foreign constructions. And yet it is conspicuously absent in our coursebooks, although it is easily understood and will eventually help students to build more sentences along the same lines. They can analogise, improvise and risk sentences they’ve never heard before, which is the essence of language learning. That’s the point, the crux of the matter. past tense forms like sticked, bringed, putted, hitted. All these forms which they can’t have retrieved preformed from memory, show that they are well on their way to grammar even if they overshoot in these cases. Language acquisition is innovative and creative. It is not the acquisition of a growing repertoire of ready-made phrases or formulas with which tourists try to operate. Children not only imitate –initially this is all they can do – but then they go beyond what they’ve heard. They generate language, and through language, new ideas. This happens all the time, but we can only be sure that they don’t just reproduce what they’ve heard if they produce unconventional and ungrammatical language. Let me conclude this part by insisting that only with double comprehension can learners bring the basic and exclusively human property of language into play, its combinatorial power. It’s the core property of language, according to Chomsky, the core capacity which in our teaching methodology is referred to as the generative principle. In Humboldt’s famous words: We can make infinite use of finite means. Notice the two aspects of the combinatorial power of language: the inexhaustibility of what is sayable and thinkable. By manipulating the building blocks of language we produce new thoughts. Language is not just for communication, it’s for thinking as well as for communication, it’s our thought organ. This trick, so to speak, of combining and recombining, accounts for the vast expressive power of language. Is grammar the motor of thought? Does grammar make us smart? Smarter than all the other beings on earth? Question mark! What follows from this for teaching? What shall we do, as teachers? What shall I do with my hair? What shall I do with my back (it hurts)? What shall we do with our maths teacher (too much homework!)? What shall I do with my wife? What shall do with my life? We have thus opened up completely new dimensions and are miles away from drunken sailors. In other words: A sentence must become a recipe for many more sentences, a germ cell for numerous other sentences. But watch out! Sentence variations must be experienced as sense variations, not just as syntactical manipulations, as Humboldt reminds us. We may safely assume that children who permutate sentences even in non-communicative situations are interested in the novel ideas which they generate, and not in syntax. The problem is that pattern recognition, our innate instinct for analogy, comes only into play after a fair amount of concrete linguistic material has been learned (Tomasello 2002, 98). 2. We must practise a construction so it can take root and learners feel encouraged to risk something new on the analogy of what is familiar. The solution I propose are semi-communicative bilingual pattern drills. They ought to be a cornerstone in our teaching methodology. I shall spend the rest of this lecture to show how they work in practice. 1. Select a sentence that can be easily turned into a productive pattern from a basic text that has been studied carefully. It could be song, a story, a dialogue. The sentences are thus anchored in well-understood situations, but must now be freed from their embeddednes in a specific situational and linguistic context. Here are two dialogues performed by my primary school children who I teach once a week, in the last lesson of the day: English is cool & Black eye sketch. Wrong World is another such basic dialogue which the children have to act out: The very first sentence contains an important construction: Will you make me a sandwich? 2. Make sure the sentence is doubly understood. Learners should know what it means and how it means. Machst du mir mal bitte n Brot? Machst du mir mal bitte zwei Brote? Hilfst du mir mal bitte? Spielst du mal bitte mit deiner kleinen Schwester? Wollt ihr mal bitte stille sein! Now make your own sentences. 4. Every bilingual drill is turned over to the students and thus becomes monolingual: Now make your own sentences. Don’t give too many prompts, but leave space for the learner, so that they can come up quickly with their own sentences: Will you please help your father / big sister/ friend etc. 5. Use your voice, mimes and gestures to support meaning: „Wollt ihr mal bitte stille sein!“ That’s what makes oral MT cues effective. Etwas stimmt nicht mit dieser Welt. Etwas stimmt nicht mit meinem Computer. Etwas stimmt nicht mit unserm Lehrer. Etwas stimmt nicht mit ihm. Etwas stimmt nicht mit meiner kleinen Schwester. Now make your own sentences, English sentences. All you want is love, but all you get is video. The teacher’s idea is to practise the formal device of a ‘contact clause’ where the relative pronoun is left out. But in the minds of the pupils, these are variations on the theme of wishes and dreams, rather than a structure drill. The teacher asks himself how he can show his pupils through interesting substitution possibilities that this construction is suitable for their own needs of expression. His job is to probe the communicative radius of a construction, explore its semantic potential. The exchangeable sentence elements become of greatest importance. The next example is taken from the dialogue Home sweet home. This is a wonderful opportunity for students to experience the function and form of present progressive constructions. T: Ich mache einen Kuchen, bin dabei, einen Kuchen zu backen. In English? T: I‘m baking a cake. S: I‘m baking a cake. T: Ich mache grad ne Pizza. S: I‘m making a pizza. The example shows that repetition and easy substitutions are necessary for the learners to establish the specific sound structure of a construction and to get into the rhythm of it. Mistakes will be made, but will be ironed out, or practised away, through repetition of correct constructions. Part of language learning is habit formation, and this takes several successful repetitions, perhaps up to a dozen. Repetitions are necessary for new constructions to take roots. Naturally mother tongue cues don’t always succeed. It can happen that the mother-tongue words rather than the idea expressed functions as the mental trigger. In other words a pupil begins to translate, constructing an English sentence word for word analogous to the German wording. We need experience to effectively deal with or forestall interference errors. Most of the time errors can be prevented through appropriate cueing and sequencing or immediate prompts (schlichtes Vorsagen). Aber ich mach doch grade meine Hausaufgaben. Use: doing. But I‘m doing my homework. Und ich spiele grad Geige. Aufpassen…die Geige! And I‘m playing the violin. 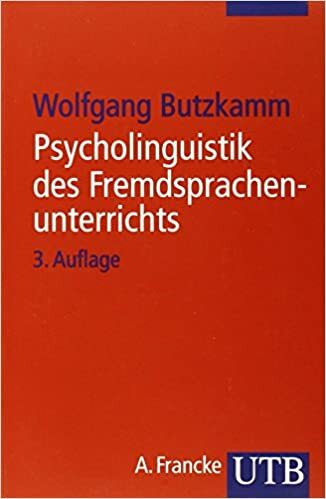 The aim is of course for the pupils to operate at the content level and de-verbalise the mother-tongue cue, as conference interpreters do (deverbalisation hypothesis, see Butzkamm 1993, 57). In traditional monolingual pattern drills the pupil solves a formal problem: a word or word group has to be substituted at the right place. Bilingual drills run along different mental tracks. With mother tongue cues the pupil expresses an idea, as we do in normal speech. Where the idea comes from is of course important, so we always switch from teacher’s cues to sentences generated by the students themselves. The drill presents or exemplifies constructions instead of describing them, and simultaneously reveals their communicative range or radius. The rules are caught rather than taught. No analytical and terminological overkill, as is often the case in the teaching of grammar..
We can help students to get into the rhythm of a construction and maximise language turnover through reciprocal pair work. Here is the dialogue Head Boy / Head girl adapted from the Peanuts series. I’ll help you / we’ll vote for you / I’ll do it and so it suggests itself for practice. The teacher starts the drill as usual but then hands out a worksheet with German-English parallel columns. One partner gets the sheet and acts as the teacher who gives the mother tongue stimulus sentences. Okay, ich mach’s. – Okay, I’ll do it. Whenever his partner hesitates, he will prompt him with the correct answer. Double comprehension again: Because before the drill starts, the teacher explains: „We say: Ich mach’s. But the English say it differently: Ich werd’s machen.“ So the pupils notice the contrast. With MT cues, we don’t shy away from the contrast, we take the bull by the horns. Habit formation again: Through repetition + variation the foreign construction becomes less foreign and begins to sound natural. Learners start developing some kind of Ohrgefühl / Bauchgefühl for this construction. Only recently a Realschul-teacher pointed out to me, that good pupils could be trusted to write these exercises themselves, then be the teacher and practise with the class. A classical example of Learning by teaching (LdL). With this activity learners can experience a sort of language explosion, because the number of sentences made available to them is rapidly increasing, and chances are that learners could eventually use some of them for personal communications. I also suspect that bilingual drills are particularly useful if we can bring the FL and the MT into sharp contrast: How long have you been doing this? Wie lange schon…? Learners must make the equation: the German wie-lange- schon-phrase is associated with the English have-been-doing construction. The crowning glory of bilingual pattern drills is when the teacher succeeds in giving sentences, i.e. ideas that relate to problems of the day, in other words, when he can personalise, individualise or localise his sentence cues. Here’s an example (grammar school, 2nd year English) where the teacher alludes to an impending general election in Germany in 2005: Schröder vs. Merkel. The class had been practising somebody needs somebody or something. Angie (Merkel) braucht Hilfe.Sie braucht Hilfe von ihren Freunden.Angie braucht Hilfe von den Wählern. Say: voters.Herr Schröder braucht auch Wähler.Sie alle brauchen unsere Stimmen. Say: votes. Angie needs help.She needs help from her friends.Angie needs help from the voters.Herr Schröder needs voters, too. They all need our votes. And you could end up with: Jeder braucht einen zum Liebhaben. Everybody needs somebody to love. It’s a pity I didn’t remember the phrase at the time. This distinct focus on meaning would be impossible without L1 cues – which shows that the controversy about the use or non-use of the students’ native language is not to be solved with the banal advice to use it “judiciously”. Admittedly, a drill series cannot focus on meaning in its full force, because here language is not used in social encounters. So never have pattern drills been meant to replace truly communicative activities. But can they prepare for them? Yes, they can. The teacher can always step out of grammar practice, he can do as if the pupil meant it seriously and can thus build small communicative islands in a sea of language practice. Here is an example from a fifth form in their very first year English in a German secondary modern school of the 1980s (Hauptschule). The teacher (Stefan Eschbach) takes the sentence I’ve got a good idea from a previously introduced dialogue and starts with a bilingual pattern drill. T: Ich hab‘ einen phantastischen Einfall. P: I’ve got a fantastic idea. T: Wir haben eine wunderbare Idee. P: We’ve got a wonderful idea. T: Er hat immer gute Ideen. P: He’s always got good ideas. T: Ehm… Ich hab‘ ’ne grüne Idee. P: I’ve got a green idea. T: Ich habe ’ne blaue Idee. P: I’ve got a blue idea. Stefan’s pupils had only a few adjectives available for substitutions. The teacher therefore makes a virtue out of necessity by presenting these comical sentences – just one of the means of shifting the focus from form onto sense. There is sense in nonsense! T: Ich habe einen dummen Lehrer. – Okay, Jenny. P: I’ve got a silly teacher. T: Have you got a silly teacher? T: Ehm… Would you … ehm … be so kind as to tell me his name? Naturally the teacher receives an immediate answer which he was in fact expecting: he himself is called Mr. Morrison in his English lessons. This is a very brief communicative exchange, but we all start small, don’t we. As a final step, the class can be instructed to write their own dialogues in groups, i.e. to change basic dialogues by using the sentence variations just practised. Remember the dialogue Home sweet home? Lucy: What‘s going on here? Charlie Brown: I‘m helping Snoopy to bury a bone. Can‘t he do that himself? Charlie Brown: He hates getting his hands dirty. Sorry, but who‘s playing football? Peggy, Mary, Betty, Ann and I. Girls playing football? What are the boys doing? And after a group presents their play, there is an opportunity for the class to ask questions, to comment on the play and even suggest how to improve it. The teacher helps to clarify what was perhaps unclear. This allows for some spontaneous messsage-oriented communication which is, ultimately, what we need. Because, as we all know, we learn how to communicate by communicating. So we are getting the results. Carl Sagan said: „When you are in love, you want to tell the world.“ Yes, and when you really have a message, you also want to tell the world. I feel I have a message to put across, because what I’ve just told you is far from the mainstream, and I feel passionately about this. „Why Make Them Crawl If They Can Walk? Teaching with Mother Tongue Support„ In: RELC Journal 42/3, (2011), 379-391. The lecture is an attempt to revitalise pattern practice methodology with concrete examples taken from various classrooms. Observations of how learners acquire languages naturally without pedagogical interventions provide a theoretical foundation. In the first part, I argue that double comprehension (understanding both functions and forms) is the most important single factor in language acquisition. I then present semi-communicative bilingual drills as an exercise type which facilitates pattern recognition, achieves fluency through oral repetition and focuses on meaning rather than on syntactical manipulation. Although the drills work with contextless sentences, these sentences can be processed as fragments of discourse and can lead right into communication, as documented in lesson transcripts. The problem of learning transfer from drill speech to real speech can thus be solved. Children hear complete utterances, not just individual words. They understand messages, i.e. what is meant, and later produce messages. But the input they receive must ultimately be comprehended at two levels: They must also detect / extract the recurring patterns behind the utterances, they must free the words. Why? Because they must learn to recombine the meaning components in new ways in order to say things they’ve never heard before. They try new sentences & novel ideas and thus make infinite use of finite means. Double comprehension is the most important single factor in language acquisition and foreign language learning. 3hours-per-week learners don’t get the amount and type of exposure necessary for both understanding the messages and finding the patterns all by themselves. But they all have a naturally acquired language – a huge cognitive capital accumulated over years – which is used to crack the code of foreign constructions. Teachers must work with this capital rather than ignore it. Sentences taken from well-known texts must be perceived as sentence patterns and become a recipe for many more sentences / ideas. Bilingual pattern drills with a dual focus both on fluency and on content can be processed as fragments of discourse and lead right into communication. Do it yourself! Choose a productive pattern and devise your own bilingual structure drill along the lines laid down in the text. Try it out on your group. Can you adjust your sentences “to the moment”, to the needs and preferences of your fellow students? Can you spontaneously involve them in short communicative interludes? Compare bilingual drills with the standard monolingual exercises of schoolbooks. Discuss strengths and weaknesses. Rivers notes in her learner’s diary (1979, 77): “It is very important to try out in new sentences what you have just learned, if not to others, at least in private talk to yourself”. Do you agree? Have you observed yourself doing this? “Drill work before free work. This is perhaps the most important of the precepts to be observed” (Palmer 1921, 74). Discuss. When is explicit grammatical knowledge needed, when not? When do we need a rule along with grammatical terms? Or is a mirrored version enough for learners to immediately see the point? Give examples. At the beginning the teacher analyzes the construction for the pupils and makes sure learners understand both function and form of the new construction. Should we rather rely on self-discovery? How can we guard ourselves against persistent errors which echo the students’ own language (interference errors)? The following objections could be raised by adherents of the communicative approach:1.Producing new sentences on one’s own is still far away from real conversation. 2. One should not practise with isolated, disconnected sentences because they are non-communicative. Discuss. Dieser Beitrag wurde unter English articles abgelegt am 12. März 2017 von WolfgangButzkamm. In Europe, asylum seekers are taken care of by state agencies. They get accommodation and food, but that’s about it. Some of them have been living here in Germany for almost a year and they are still waiting for a final decision about whether they can stay or will be sent back. When I first met some of them, I found that even after several months of being in my country some knew only about a dozen German words and phrases. That means, there had been only very little contact with their German neighbours. However, church communities and other people are now becoming aware of the problem and people like me who are retired and have some time on their hands have arranged regular meetings where they try to talk to them and teach them some German. But here lies another problem. What is the most effective way of teaching real beginners who often come to us with mother tongues which nobody knows, for instance Twi and Tigrinya? 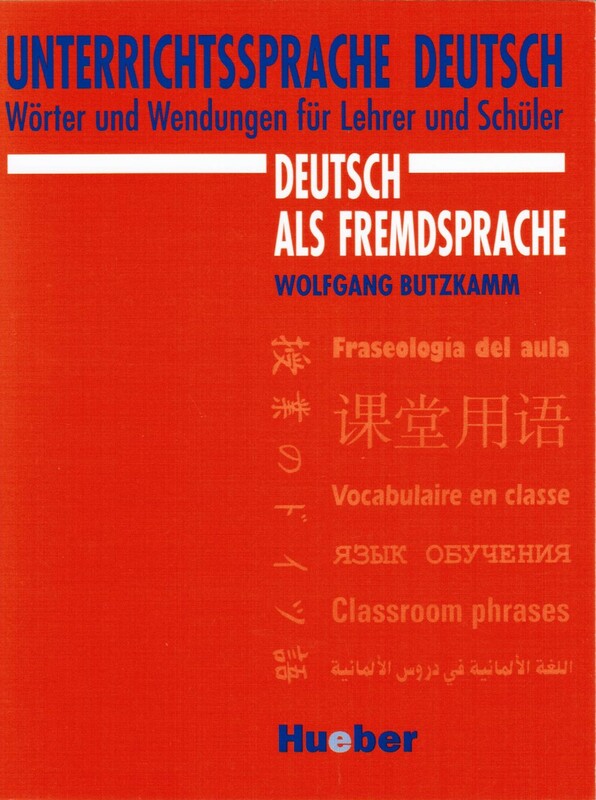 There is absolutely no doubt about it that, for beginners, a bilingual approach where the teacher can use the learner’s mother tongue (or another language the learner is somewhat familiar with) is much more effective than a monolingual teaching-learning situation where only the target language can be used. Unfortunately the latter situation is often the case as present-day immigrants often speak only one of the lesser known “little” languages of Africa. 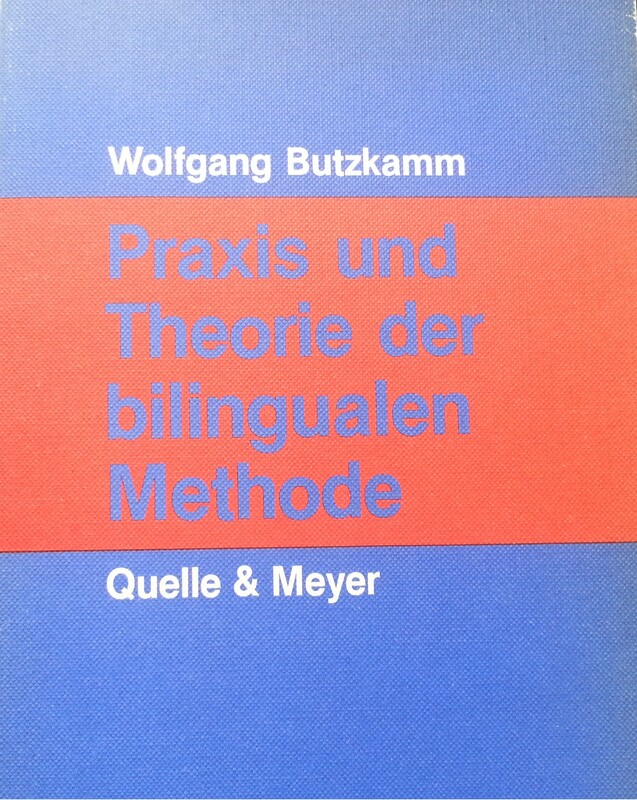 So it seems that a monolingual German-only approach (also: direct method, Berlitz method) is the only possible way. So far as I can see, this has been the policy of the German courses sponsored by the government for those migrants who were granted asylum. Learning German this way is an arduous task and painstakingly slow. It is a sink or swim method, leaving many learners frustrated in spite of coursebooks peppered with colourful pictures. However, the situation could be effectively remedied, even in multilingual classes. Experts would simply have to agree upon, let’s say 30 dialogues of the type found in almost every coursebook and create an internet site for each of the European languages concerned. Then an appeal should be launched to those bilinguals well integrated in their respective host countries and ready to provide the same texts in their home language, perhaps even free of charge. Teachers, voluntary or professional, could study the dialogues with their classes and act them out in groups. This would be comparatively easy, because every client could fully understand what he is doing and saying. With our social brains and our emotional expertise we are naturally born performers. Learners can enjoy team work and create moments of excellence for themselves and their audiences. Moreover, reference to the learners’ mother tongues implies an appreciation of indigenous languages and cultures. Meanwhile, we have started a website called Wikibiblia.de. Carefully selected Bible stories are presented in easy, modern German and in a special bilingual format. The aim is twofold: (1) To help migrants from various language backgrounds with some knowledge of German to continue making progress in German; (2) to introduce them to the common European Christian heritage. The texts should carry the Christian core message of love but should not preach Christian dogmas and are not intended to proselytise. Instead, we hope to build bridges between various cultures and languages and foster understanding between them. Knowledge creates understanding, and understanding begets sympathy. The translations should be provided by former migrants who have lived in Germany and have become fully bilingual. Migrants should help migrants. It is hoped that in this way translations in various “rare” or “small” languages will be made which have so far been neglected in terms of learning materials. Comprehensible input is precisely the basic condition for language acquisition. But the outmoded pedagogic approach à la Berlitz, which is still the rule in many language courses worldwide, is an outright denial of assistance. 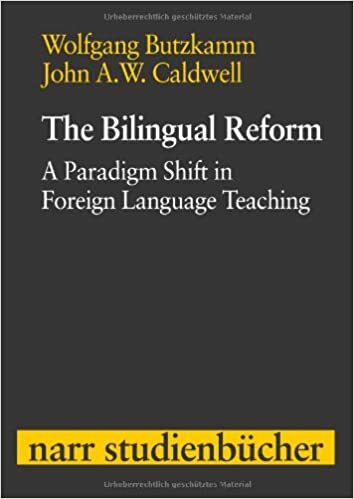 See Butzkamm & Caldwell, The bilingual reform. A paradigm shift in foreign language teaching (2009). Dieser Beitrag wurde am 29. Mai 2015 von WolfgangButzkamm in English articles veröffentlicht. Schlagworte: bilingual approach, direct method, mother tongue support, multilingual classes. My lecture falls into three parts. I shall explain (1) the principle of double comprehension as the prime requirement for language acquisition to take place. I shall move on to (2) a re-evaluation of the role of the mother tongue in foreign language teaching, which, rather than be ignored, can be made our most powerful ally. I shall explain (3) the generative principle and demonstrate bilingual semi-communicative pattern drills as a way into the grammar of a foreign language. The time is ripe for slaughtering two sacred cows of our mainstream philosophy: 1. L1 is not a last resort when nothing else will work. It is indispensable for a quick and complete grasp of new constructions, one which leaves no questions unanswered. 2. Grammar practice need not always be situational or contextual so as to lead the learner gently into communication.There is a place for pattern drills with disconnected sentences. However, drills must be presented as sense variations rather than syntactical manipulations. What are the basic conditions for language learning to take place? What are the prime requirements that have to be fulfilled? There are two. Language acquisition begins when people speak to us in ways we can understand. Comprehended input is the single most important factor in language acquisition. It is the essential precondition for our own participation in dialogue. But learners must understand more than messages. We also have to understand not only what is meant, but how the messages are put together, how they come to mean what they mean, in other words how things are quite literally expressed. So let’s distinguish these two types of understanding. On the one hand understanding what is meant: Let’s call it situational or functional or communicative understanding: We get the full message, we get the idea as precisely as possible so that we can react meaningfully to it. This understanding is something that a good, idiomatic translation can provide. The second type of understanding refers to the way the message is structured. Let’s call it structural, or formal, or operational understanding. This is something that in most cases a word for word translation can provide us with. As native speakers, once we understand the message, we also understand how the meaning components interlock to create that meaning. But this is not true for infants learning their mother tongue, and it is not true for FL learners. Here, the distinction is important because languages often express the very same idea in different ways which are not immediately transparent to beginners but remain cryptic for a while at least. I claim that a kind of double comprehension – situational and structural – is needed for all types of language acquisition, including L1 acquisition. Admittedly, to acquire a mother tongue, it seems that all a child needs is to be talked to in understandable ways, i.e. to understand messages. Okay. But as infants receive more and more comprehended input in recurring and often only slightly changing situations, they do not only understand the messages in a global way so that situations and intentions become clear, they also begin to figure out various parts of the messages, and they notice how the situations change along with, more or less in synchrony with, parallel changes in the language: “ball” might change to “balls”, if there is more than one of these bouncing objects around. With more and more speech contacts, they will break the messages down and work out the syntax all by themselves, which, to me, is one of those miracles of evolution, one of those evolutionary feats. Parents feel that here is a problem for the children. An intuitive understanding of the French phrase “maman t’aime” (which, when pronounced, could be heard as one word, a three-syllable word) is not enough. Ultimately, the child must not only understand that this is an expression of love (easy), and that it is “maman” who does the loving or where this love comes from (again easy), but the child must also detect where she herself, i.e. the loved person / the person spoken to is hidden in that phrase and must separate it out from the idea of loving. This is difficult because she only hears a continuous flow of language and does not see this phrase in print where the meaning components are clearly separated. It is also difficult because the person talked to is only represented by just one sound, the consonant t. So parents intuitively help the child. Instead of “I love you”, she says “Mama loves you”, or even “Mama loves Mary”, which makes it easier to relate event components to message components, to make a form-function connection and crack the code. Parents do quite a lot to make the child’s job easier, but it’s the babies themselves who contribute the lion’s share. Little by little researchers begin to understand that babies’ brains make complicated calculations with the conditional probabilities of languages which they are constantly revising to figure out how the language works. Now in order to do their statistics they need massive amounts of input over many years and they get it. This is the critical mass hypothesis. But, for a foreign language taught at school there is simply too little input, too little exposure, there are too few meaningful interactions for learners to make these form-function connections and extract the patterns all by themselves. Teachers must actively and comprehensively support the process of double comprehension and pattern recognition. Do we need to know this? Yes, we do, if we want to acquire the FL instead of just making ourselves understood for a moment. Knowledge of the structure not only helps us understand why the phrase means what it does, it equips us with a key phrase we can draw on in the future. We can risk new, analogous utterances such as ‚si l’hôtel vous plaît‚, ‚if you like the hotel‘; ‚si le vin vous plaît‚, ‚if you like the wine‘. And we can understand similar, as yet unfamiliar utterances when we hear them from others. A mere situational understanding from the context does not help the language learner very much. He also needs to understand how the foreign language operates, i.e. identify words and recognise patterns in order to be able to make “infinite use of finite means” (Humboldt 1836 / 1963, 477). (Language … confronts … a truly boundless area, the scope of everything conceivable. It must therefore make infinite use of finite means.”) Without this analysis, learning a formula such as “s’il vous plaît” would remain mere vocabulary drill. Fejn hu l-katidral Where’s the cathedral? Fejn hi l-knisja? Where’s the church? Fejn hu l-ktieb? Where’s the book? * Where he the cathedral? * Where she the church? * Where he the book? omitting, like many other languages, the copula “is”, it all makes sense in a satisfying rush of insight, and we feel ready to ask our own where-is-questions. We love it when we get the trick, don’t we, when we get the hang of it. Only after recognising the component parts for what they are, after understanding both what is meant and how it is said, can we analogise on the basis of this insight and acquire a productive sentence pattern. So the generative principle comes into play. Or take a visitor to China who wants to be polite and picks up the greetings phrase: “Ni hao”. But only if he can break the phrase down (= *You good), will it become a stepping stone to other phrases such as “wo ai ni” (= I love you), where „ni“ reoccurs. A German teacher, who teaches monolingually, at the end of the lesson often used the phrase “See you tomorrow”, a phrase that the kids didn’t see printed. Most kids got the idea. For them it meant “Till tomorrow” since that’s the natural German equivalent. It’s a time phrase. But only if the phrase was mirrored in German: *”Seh euch morgen”, countless location phrases such as “see you in the playground” would also be easily accessible. Excuse me for multiplying examples for what may seem obvious. But I need to insist here on the generative principle which is largely ignored by the communicative approach or other recent methodologies. It refers to the human capacity to generate an infinite number of utterances from a finite grammatical competence. It reflects what Humboldt thought was the crucial feature of human language, wich is sometimes called compositionality. Meanings are built out of parts and from the way these parts are combined. A finite stock of words or word groups can be recombined again and again to produce innumerable novel sentences ( – and thus, new ideas). Telling the time of the day provides illustrative examples of how differently languages operate to express the very same ideas. It’s a lesson popular with teachers because the meanings are crystal clear and the lesson can be easily conducted without resorting to the MT. I remember a French teacher who was practising telling the time in French with a toy clock. The pupils used the time phrases correctly, but as an observer, one couldn’t help having the impression that some of them had no idea of how the French expressed the phrase “five minutes to eight“ = “huit heures moins cinq”, i.e *eight hours minus five, which means five minutes missing, five minutes to go until it is eight o’clock. I think they would have welcomed this information of how the French actually construct this idea. Likewise, English learners of Polish would probably welcome a mirrored version of the Polish phrase. I also observed that learners spontaneously use mirroring all by themselves. In a school in Geneva I overheard a French speaking boy saying: „En allemand on dit ‚le petit bleu poisson'“. The boy was actually trying to make sense of the German phrase, and to make it legitimate, so to speak. Why has this largely been overlooked by our textbooks? To sum up: Simple understanding from the context of the situation does not lead the language learner far enough. Multi-word utterances must be broken down for us to understand their internal grammar. Only to the extent that we understand both meaning and form can we turn input into intake which can be processed syntactically. Only then can we make utterances of our own which we have never heard before. So much for the fundamental principle of double comprehension. Now what have I done? I have given you FL examples and clarified them via English, a well-known language to you. If I knew Polish, I would have used it instead of English. Because the perspectival flexibility of a naturally acquired language to elucidate the form-meaning constructions of an unknown language is without equal. The best window on the logic of a foreign language is a naturally acquired language – usually the mother tongue – for which we have developed a real intuitive feel. I‘ve used English here in two ways: idiomatic translations for message comprehension, and for structural comprehension I have used a kind of literal translation which I have called mirroring. The foreign phrase is imitated in the native language. The native language is bent and twisted and pressed into service to reveal the FL structure. With your mother tongue, you usually know how far you can go in twisting and bending and adapting it to a foreign structure before it in itself becomes incomprehensible. No, no. no. If this sounds like nonsense, well, it is. We can never duplicate L1 acquisition in the classroom. Okay, then, Let’s have a fresh look at the role of the mother tongue. Theoretically, it’s all very simple. You don’t learn basketball when all you do is play volleyball. So we can’t learn English by constantly using Polish . We only learn English to the extent that we actually use it. This is blindingly obvious. But there is another side to the coin. We all must start from where we are. We can only learn a new skill by building upon existing skills, by making the connection. This, too, is common sense, this, too, is self-evident. It‘ s also what brain research tells us. We‘ ve got to use established neural pathways and then extend and modify them. So the opposite notion equally carries conviction. It follows from the first premise that a language has to teach itself. It follows from the second that we must engage the language skills acquired and promoted by the MT. The allergy to the presence of the MT in the FL classroom undoubtedly comes from its all-too-frequent misuse. „One obvious explanation for the pervasive L1 use in FL classrooms is the low proficiency levels of teachers.” (Krista S. Chambless, in Foreign Language Annals, June 2012). This is not happening way back in Siberia or with underpaid teachers in the African bush. It’s about language teachers in the USA. Well, yes, it’s a real fiasco when less skilled and less proficient teachers simply succumb to the ease of conducting the class in the MT. I can’t go into this here. But the counterproductive, haphazard, inconsiderate and time-consuming use of the MT in FL classrooms has certainly been a barrier to the true understanding of the issues involved. Because years of daily encounters with a first language have given the children foundational skills which they need for school. Because years of MT input and interactions have shaped our minds in ways that are overwhelmingly helpful for the acquisition of new languages. By the time they start with foreign languages at school, children know a lot about language. As they grow into their mother tongue (1) they have learnt to conceptualize their world and have fully grasped the symbolic function of language; (2) they have learnt to communicate, and combine language with body laguage; (3) they have learnt to articulate and use their voice; (4) they have acquired an intuitive understanding of grammar; (5) they have acquired the secondary skills of reading and writing. In acquiring a first language, they have in fact constructed their selves. The MT is therefore the greatest asset any human being brings to the task of FL learning, it is the sharpest tool to cut into the FL and reveal its anatomy. It provides an indispensable Language Acquisition Support System. If learners did not use this support and make the connection all by themselves, in their minds, FL teachers wouldn’t get anywhere. In a nushell: We only learn language once. In the following, I shall restrict myself the problem of grammar. Many grammatical features are directly available for incorporation into the L2 system. However, the path breaking power of L1 grammar is not dependent on the fact that both languages share some grammatical features. MT grammars have paved the way to foreign grammars in ways which are often overlooked. Let us be quite basic here, for the sake of clarity. What could you do with learners who didn’t have the concepts of ‘before’ and ‘after’ in space and time? How can one expect students to understand the essence of the continuous aspect if they didn’t have the notion of duration? Children do have problems with handling time sequences when the second event precedes the one mentioned first: “Before he left, he had another beer”. This is misconstrued as “he left and then had a beer”. Consider that complex structural areas such as tenses or passives are acquired step by step. In the beginning, children’s strategy of taking the first noun in the sentence to be the agent leads them astray when confronted with passives. In L1 English or German this is gradually sorted out, firstly through cases of semantically irreversible passives such as “The girl was bitten by the spider” which then spreads to semantically reversible passives. Their knowledge of the world helps the children to re-interpret the sentence. However, by the time the child comes to learn a FL, most of these difficulties have been overcome and we need not go the same long way to grammar a second time. We may, for instance, take it for granted that we can say “my head” and “my father” as well as “my garden”. But we are also mentally prepared to use a different possessive for “my garden”, as some languages in fact do – because it makes sense to distinguish between ‘alienable’ and ‘inalienable possession’. Even if there is no conjunction “if” in a language, that language can express conditions, and our mother tongue has the means of clarifying these if-less constructions. It is because all languages have evolved means of expressing abstract ideas such as possession, number, agent, instrument, negation, possibility, condition, obligation and a host of others, no matter how they do this, that one natural language is enough to open the door for the grammars of other languages. It is because “all languages are cut from the same cloth” (Pinker 2002, 37), it is because all languages dance the same dance. To sum up. It’s all there already. The challenging engineering problems that children have solved as they learn to speak are coming to light more and more. It has taken children years to obtain the cognitive, communicative and grammatical competencies which make instruction possible in the first place, be it maths, geography or another language. Many skills and knowledge sources are available at the FL initial state. They are the base camp from which we all set out to conquer new language territories It makes excellent biological sense for a new language to piggyback on this open channel of communication. All this has been largely ignored by the monolingual teaching philosophy. Comprehension and explanation are ways of knowing. But speaking is a skill, so knowledge must be turned into a skill. Comprehension must be followed by practice. I’ll now move on to a particular teaching technique, i.e. to bilingual pattern drills and show you the generative principle, with MT support, works in practice. Remember that pattern drills were designed precisely to help the learner make infinite use of finite means, to help him build new forms according to known forms, to use a model sentence as a slot-and-frame pattern for countless other sentences. In the sixties and seventies pattern drills were all the rage, mostly in the USA, literally filling hundreds of pages with substitution tables and transformation drills. But an error was made. Linguists, i.e. structuralists and their audiolingualist followers claimed that structures were all important and, in comparison, words were negligible: “Vocabulary comes and goes. It is the least stable and even the least characteristic of the three components of language.“ True, in a way, but there is a misunderstanding. ‘Language … confronts … a truly boundless area, the scope of everything which can be thought. It must therefore make infinite use of finite means, and it achieves this through the identity of the power to generate both thoughts and speech. According to Humboldt then, combinatorial grammar explains the inexhaustible repertoire of language and thought. Sentence variations must be experienced as sense variations, as variations on meaning. Since language has the power of producing “both thoughts and speech”, we do not just generate novel sentences, but new ideas at the same time. After all, this is what language is for: to communicate thoughts and ideas from one person to another. Words are not there just to play around with, but to convey intentions and ideas. If words are unimportant, pattern drills can easily turn into a self-contained language game, a mere manipulation of forms, with little relation to the world of ideas and events: In traditional pattern drills, meanings were there, but weren’t focused on. The problem seems to be that Humboldt’s energeia is usually only familiar in its abbreviated formulation ‘making infinite use of finite means’ and is thus interpreted in syntactical terms only, and not in semantic terms. This is probably why pattern drills frequently turned out to be mechanical and monotonous. How could practice on disconnected sentences further communicative competence? To transfer or not to transfer – that was the problem. Audiolingual theory was patently wrong in treating words as mere gap-fillers, a convenient device to avoid the monotony of overlearning the all-important sentence patterns. Instead of re-thinking them, pattern drills were dropped like a hot potato. But pattern drlls, after all, tried to capture what for Humboldt and many researchers is the quintessential property of language, which makes it so extraordinarily powerful, namely our ability to use a finite set of symbols which we combine and recombine to create new meanings. So they should never have been dropped, but re-designed. That’s precisely whatwe have tried to do. Bilingual pattern drills use oral MT cues, and this makes all the difference, because this ways we start with ideas which have to be put into FL words. There is a dual focus, on content and on fluency. Ideas, not just words, are played with and structures are manipulated accordingly, and the semantic potential of a given structure is explored. Unlike conventional pattern practice, lexical substitutions are not regarded as mere fillers. Without further ado, let’s jump into teaching practice. Another objection raised against pattern drills is that they work with isolated sentences, which would be ineffective in principle. But even in the absence of a context of situation, disconnected sentences, if understood, inevitably take on meaning because the listener can immediately imagine fitting communicative contexts. Can’t you imagine those contexts on the spot, spontaneously? Wouldn’t we all know without giving it a moment’s thought when, where and to what intents and purposes we could use these sentences? This is because the sentences express common concepts familiar to us via the MT. All dictionaries operate with illustrative disconnected sentences because we can make those sentences real for ourselves. That’s why our students are not performing language operations in a void. It is high time the myth about ineffective isolated sentences be dispelled. The successful completion of step seven is also evidence for the fact that isolated sentences can lead directly to a context of situation. A bridge is built between pattern practice and creative message delivery. • The need to spot the pattern or regularity of a sentence, to see the slots into which different words may be plugged. • The need to find new, analogous items to fit the perceived pattern, thus learning how far one can ride a given pattern and establish its limits. • The need to entrench and to automatise a given sentence pattern, achieving fluency(these three needs have been met by traditional pattern practice ). • The need to probe the communicative radius of a structure and explore its communicative potential, i.e. the need for the proper words. • The need to integrate the new pattern into the existing language repertoire and to employ it freely in conversation. • Use productive patterns of wide applicability, which give the learner a lot to learn from. recognize the common grammatical thread. • Begin with simple, easy sentences in rapid succession; move on to interesting sentences. The MT cues are supposed to trigger abstract concepts which in turn trigger the FL construction. This is the psychological pathway we normally follow when we say anything: from concept to expression. The drills should provide plentiful exposure to the relevant linguistic forms in the shortest possible time. Drills should be followed by creative and more communicative activities as explained and documented by Butzkamm & Caldwell. I’ve tried to explain and demonstrate to you an activity based on two ideas which were frowned upon, well, condemned as Neanderthal practice, by the mainstream philosophy. The monolingual dogma tried to banish the learners’ native language from the classroom. The communicative dogma rejected pattern drill and disconnected sentences. “Thirty years ago I was so much part of the Direct Method orthodoxy of the day that I frowned on bilingual dictionaries and one day found myself miming the word ‘although’ in an elementary class! There were brilliant people in the class: one student whispered to another, ‘He mean “but”?’ When I learnt Spanish academically at secondary school, I wore out a couple of bilingual dictionaries in my keenness to launch from the mother tongue into the unclear waters of the target language. In my teenage foreign language work, mother tongue was the semantic bedrock that all my explorations built up from. How had I managed to exclude my real experience as a language learner from my practice as a language teacher for so many years?” Thanks, Mario, for being so frank. Dieser Beitrag wurde unter English articles abgelegt am 24. 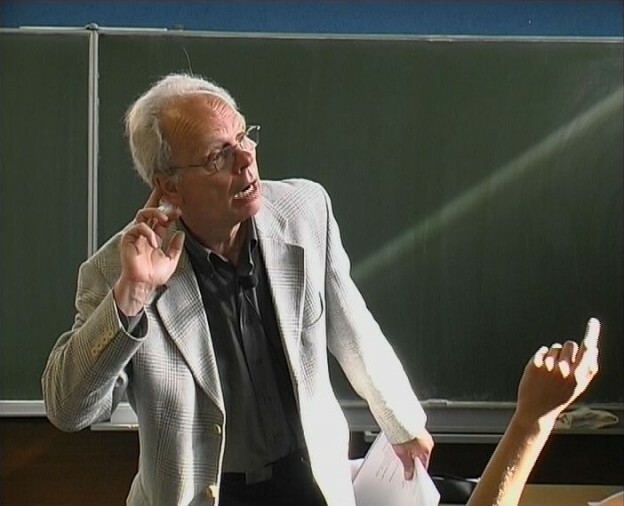 April 2014 von WolfgangButzkamm. I have chosen the for +noun / pronoun + infinitive construction. 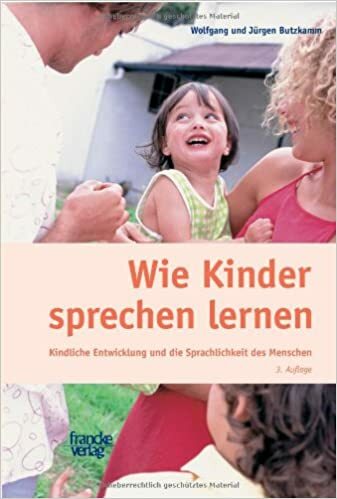 Though it is eminently useful and transparent to speakers of many languages, I believe it is not much used by intermediate learners – admittedly I have no evidence for this- , simply because German and other languages prefer other constructions to express the same idea. For human rights to flourish, religious rights have to come second. For this to happen, we must act now. For this to work well, we need to know more. The open contrast between German: dependent clause, and English: infinitive works as a kind of inoculation against unthinking transfer of mother tongue habits. If the students hesitate, for instance with the negated version, the teacher simply gives the English sentence himself and asks the students to repeat it. Step 3. Perhaps the above examples are enough for a good class. The teacher has set the class on the right track and hands the activity over to the students: “Now make your own sentences along the same lines.” Alternatively, the teacher can allow a few minutes of silence for the students to jot down their ideas. This step is a must. The students must get the chance to experiment with the new construction, and the activity becomes monolingual. The mother tongue drops away. Es ist schon okay, dass du das sagst. Ist es okay, wenn ich das sage? War es okay, dass ich das gesagt habe? …falsch von uns, jetzt zu gehen. Ist es normal, dass das passiert? Ich hätte es liebend gern, dass dies passiert. Ich hätte es liebend gern, wenn er käme. It’s okay for you to say that. Is it okay for me to say that? Was it okay for me to say that? It would be wrong for us to go now. I would love for him to come. The students will now find it easy to come up with their own meaningful ideas, using different adjectives and different pronouns: easy for us to…, unusual for them to…, not uncommon for him to…, important for her to…. Repetition is habit-forming , and believe it or not, part of language learning is habit formation. For correct speech habits to be formed, we need plenty of language turnover in comparatively little time (The for-construction again!). This is what the exercise provides. Count the number of sentences the students have heard and produced and compare with other exercises which take the same amount of time. Es war richtig, dass sie weitermachten / weiter zu machen. War es richtig, dass sie weiter machten? Es ist richtig, dass sie weiter macht. It was right for them to continue. Was it right for them to continue? It is right for her to continue. This is a way of playing it safe. But it can easily become boring unless the pace is rapid. Well, yes, this is pre-communicative practice, but see Butzkamm & Caldwell to show you how this kind of drill can lead a class right into message-oriented communication. There is no way to skip the groundwork. Just one more example. Years ago, I tried what follows with grammar school kids in their first year of English. The textbook introduced the past tense rather cautiously, restricting the new forms in a first step to was / were / had. Okay, this is grammar, but for the pupils was / were / had are simply new words with a clear meaning, just like bread or butter. Tim & Tom waren da. Alle meine Freunde waren da. Ich war in der Küche mit Tom. Wir waren in der Küche. Es war ne warme Nacht. Betty war nett / freundlich. Sie war nett zu Tom. Aber Tom war nicht nett. Tom war schlimm / schrecklich. Tim & Tom were there. I was in the kitchen with Tom. We were in the kitchen. Some were in the garden. She was nice to Tom. Mother tongue stimuli here work better than anything else,because of their flexibility. We can even construct drills that tell a story, sort of. 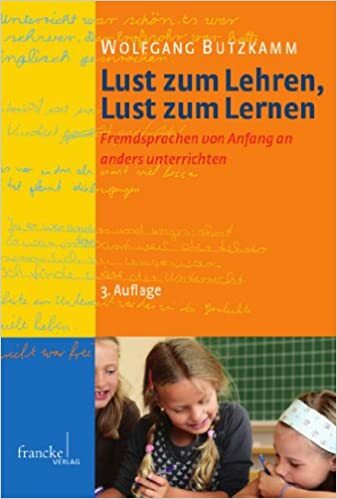 I remember leaving the classroom in almost a state of euphoria, firstly, because the students obviously enjoyed the activity and were able to make their own sentences, and, secondly, because it confirmed a long-standing conviction of mine: the monolingual approach, which has been talked up for more than a century, is a fundamental error. Dieser Beitrag wurde unter English articles abgelegt am 20. Januar 2014 von WolfgangButzkamm.